Has Climate Change Already Killed Us? If you miss the headlines and dive straight into the stories, you might be inclined to believe that we're about a half-step from committing suicide -- we being humanity, that is. I'm not sure it's a belief you should dismiss. Sci Fi Wire has a great interview with futurist Bruce Sterling about the consequences of fiddling while Rome burns (and the coastlines vanish, and the ice caps melt). It's not the most optimistic discussion I've read. Assessing the scale and urgency of global warming, Sterling says, "The wolf is at the door. With the possible exception of the nuclear arms race, this is the gravest emergency the human race has had in its recorded history." But humankind is not exactly responding with vigor: "I'd love to say we're 'facing' this crisis, but we're not facing it yet, we just 'have' it." "Also, scientists and engineers should be taking direct action. Leaving this crisis to politicians, journalists and activists was an unconscionable dereliction of duty on their part. I hope the scientific community feels properly ashamed at their failure to grasp the full reality of climate events and the effect that lapse will have on their fellow citizens. "The climate crisis is severe. Basically, we've fouled our nest so energetically that our nest is rapidly becoming one big foulness. We brought that disaster on ourselves. But we're not the source of all the trouble in a turbulent universe. If we pull ourselves out of this self-made climate tailspin, maybe we'll be a little less eager to flatter ourselves in the future. We need to become more watchful and alert, more aware that the Earth was not served to mankind on a silver platter. The Earth is a nice place, but Copernicus was right. One of the more exciting projects happening in the City of Richmond these days is the restoration of the once-fabulous lake in the heart of Forest Hill Park. Richmond Magazine's Harry Kollatz once again demonstrates how history and current affairs can mix to create a great story, and turns his attention to the lake's history and a story of the modern efforts to reclaim another of Richmond's forgotten treasures. And, as he notes, not one word about baseball. ...silt filled the lake, turning it into wetlands, though trees rooted and died there that weren't suited for marshes. Periodic plans to excavate the lake got nowhere, then then came Hurricane Isabelle, the remnants of Tropical Storm Gaston and other concerns to boot Forest Hill Park off the priority list. But former mayor Doug Wilder and the City of the Future plan ran funds through the pipeline that now are getting work accomplished here, at Byrd Park Lake and at Joseph Bryan Park. Eric and Erin Ziegler, brothers who are working for Mobile Dredging & Pumping of Pennsylvania and who'll live in Richmond for about six months while pumping out the lake, explained the technicalities of the process. The Zieglers are part of the group running the big throbbing machines that will "dewater" the marsh, followed by sucking up the muck and transporting it uphill, where it will be hauled away, some to landfill, some to Gillies Creek Industrial Recycling. Eric pointed on a diagram to forebays housed within stone containers that will sit before Reedy Creek and another meander that runs into the lake, which will act as silt strainers that will be periodically dug out and emptied by the state Department of Environmental Quality. "Reedy Creek is a tremendous watershed," Erin explained. "And this project will prevent silt from running out here into the James River." Pope asked that the public bear in mind that this is now an active construction site, so stay on the hilltops and watch from a distance. Inside a year, a lake will appear. His hope is that a small island, indicated on the original park-property plats, will get uncovered. "No special reason, " he said and grinned. "I just like islands. They're neat." An equally talented writer, Michael Martz at the Richmond Times-Dispatch, also shows up in print today with a story on the project. Plus, the TD has a slideshow of the project (including the above photo by the Td's P. Kevin Morley). The first step in restoring a historic lake in Forest Hill Park has begun with a push to rescue fish and other aquatic life there. A dredging crew began pumping water out of Reedy Creek yesterday from a narrow channel that snakes through the wetland that has swallowed the lake over the past two decades. Workers then began netting fish, tadpoles and whatever else living in the shallow pools that remain and sending them downstream toward the James River. "We'll save as many as possible," said Clint Brown, a foreman for Metropolitan Environmental Services Inc., a Ohio-based company that is working with a sister firm, Mobile Dredging & Pumping Co. in Pennsylvania, to carry out the $1.7 million restoration project over the next six months. Richmond officials say they hope the work will be done even sooner, bringing the lake back to the condition of its heyday decades ago, when it was a center for outdoor recreation in South Richmond. "Give us several months and this will be a lake again, and a great amenity for the city of Richmond," said J.R. Pope, director of the Richmond Department of Parks, Recreation and Community Facilities. The crew over at WorldChanging put their heads together and developed a list of "10 Big, Really Hard Things We Can Do to Save the Planet". Sure beats saving the planet one plastic grocery bag at a time (though there's merit there, too). Czech crowds cheered for U.S. President Barack Obama's recent announcement that America must lead the charge to eliminate nuclear weapons worldwide. But no matter which nation or alliance takes the helm, reducing the threat of weapons of mass destruction is a critical part of sustainability. Simply put, nuclear weapons have no place in a bright green future. Problems This Helps Solve: Nuclear warheads are like the anti-resilience. They don't make us safer; they actually make us brittle. And pouring enormous amounts of money and natural resources into mutually-assured destruction seems like an outdated model for peacekeeping on a finite planet. In order to have a resilient and peaceful planet, we must first meet the basic needs of all the people who live here. Each person deserves clean water, adequate sanitation, and access to health care. But building this basic foundation will also require stability of a more intangible kind, including giving every person access to education, protecting civil rights around the globe, and putting an end to human servitude. As a society, we've outlined the plan in various ways, most notably in the U.N.'s Millennium Development Goals. And we have the means to do it in this century, through advances in community empowerment, sustainable development and microlending programs. Problems This Helps Solve: The difficulties the bottom billion people face don't just waste their human potential; they also undermine global public health, accelerate habitat destruction, worsen the destabilizing effects of violence, and drag down failing states. In a very real sense, the problems of the bottom billion are problems for us all, and tied into every other problem we want to solve. Other notions that are essential (and make sense) include a transparent and accountable global society; empowering women and equal rights; enabling a future forward diet; and build bright green cities. Stop clapping your hands about reusing that coffee cup and take a gander. If nothing else, this speaks to how important the local gardening movement has become and how passionate (and wired) its members are. Now, all the gardening community has to do is convince Obama that this would be an important first step in setting an example that the whole country could follow. The Project for Public Spaces is one of my all-time favorite organizations, what with their commitment to preserve and enhance public spaces of all sorts -- streets, parks, neighborhoods, markets. Their "How to Create Successful Markets" workshop is the sort of event that should hit Richmond close to home -- the farmers' market scene in the Richmond area continues to grow and thrive. Hopefully, some of the organizers behind Richmond's burgeoning market scene are attending. Nowhere is the vibrancy of public markets and farmers markets more apparent than in New York--a city rich in cultures, food, festivals, music and street life. This workshop puts us in the heart of the action. We'll visit some of the city's most famous markets, including Union Square--a former hangout for junkies--now home to the city's best known open-air farmers market and one of the best public gathering places in the city, which draws over 100,000 shoppers on a hot summer's day. We'll also visit smaller, though equally vital, neighborhood markets, like the city-operated Essex Street Market, which shares in the growth of the Lower East Side while managing to retain its historical customer base. Finally, we'll cross the East River into Brooklyn, to visit and learn about some of the city’s best neighborhood-scale farmers markets as well as a unique program that combines youth education and empowerment, urban agriculture, and local food system development. 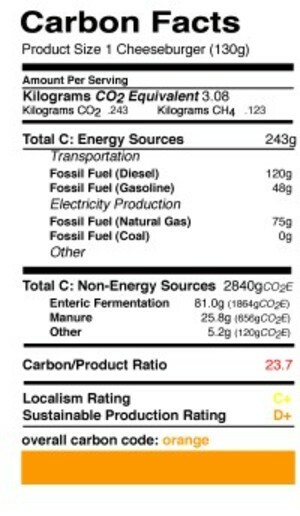 A few months ago, I saw an old post over at TreeHugger about the carbon footprint of a cheeseburger (since updated at Open the Future). It might have been the first time that it actually struck me that eating meat -- especially meat raised under the modern mantle of mass production -- had a relatively huge impact on the environment. 'In terms of immediacy of action and the feasibility of bringing about reductions in a short period of time, it clearly is the most attractive opportunity,' said Pachauri. 'Give up meat for one day [a week] initially, and decrease it from there,' said the Indian economist, who is a vegetarian. Want to keep your SUV? Stop eating beef. Or we could drop both from our diets and dramatically reduce carbon emissions.